the coniferous and birch forests as far as the eye can see, mystical Moors, shred the Mist as Feengewänder scurry and nights that are no more, because in the summer the sun scars even at midnight, only just below the horizon long: Estonia is full of places that seem more likely to be from the realm of the to Say than the reality. 29 inhabitants per square kilometre, sparsely populated, only a few countries in Europe (230 in Germany). Who is looking for the loneliest corner of Estonia, you must visit Aivar Ruunkel in the Soomaa national Park. 400 square miles in the southwest on the border with Latvia. Only 60 people live here, almost seven square kilometres. But the bars in the signal strength on the phone is not easy. After ten kilometres you have to be careful not to sheer Kontrolliererei to drive in a curve straight into a swamp. Meanwhile, the Estonian preparing mobile operators for the use of the next generation of networks: 5G. This technology will revolutionize the digitization of our life in a way. Because with mobile data transmission speeds, data rates of up to 10 gigabytes per second (instead of a maximum of 150 MB in the 4G network in ideal conditions) permit, is the so-called "Internet of things" possible. Things like automated Driving. Or the complex networking of multiple physical objects of a building, such as heating, ventilation, lighting control and Live control of multiple surveillance cameras, as well as the use of robots in the house. For Aivar Ruunkel and Canoeing in Soomaa national Park, will this technique do not put believed to be of fundamental importance. Which means that of the Este, who sees himself as a digital nomad the first grade, will not be one of the first, which will create all of the technical requirements in the deserted Wilderness. Who is immersed in the dreamy backdrop of the six small wooden houses on Halliste river, can't resist a Grin. 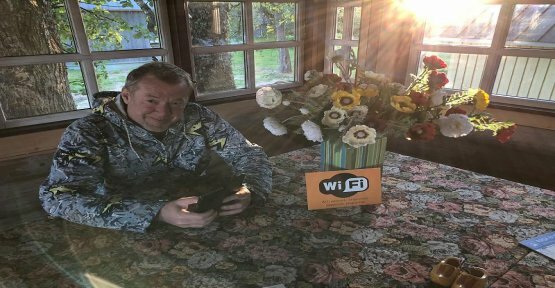 Because in the Central block of the house with rustic furniture is striking, despite the romantic is a small, orange sign in front of a baffle with a summer flower-filled Vase immediately: "WiFi" on there. The canoe-the Kid circling it with his Smartphone as bees to the nectar, the stitched eyes on the network name and password for the 4G amplifier.